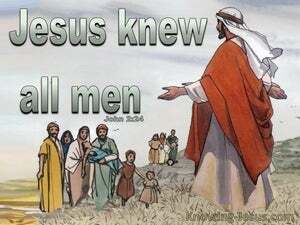 But Jesus did not have faith in them, because he had knowledge of them all. but Jesus did not trust his person with them, because he knew them all. 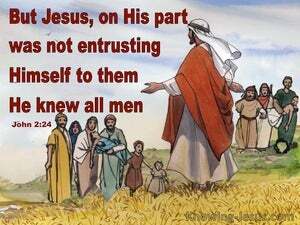 But Jesus would not entrust himself to them, because he knew all people. But Jesus did not commit himself to them, because he knew all men. 23 Now when He was in Jerusalem at the Passover, during the feast, many believed in His name, observing His signs which He was doing. 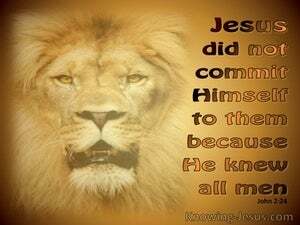 24 But Jesus, on His part, was not entrusting Himself to them, for He knew all men, 25 and because He did not need anyone to testify concerning man, for He Himself knew what was in man. but I know you, that you do not have the love of God in yourselves. "But there are some of you who do not believe " For Jesus knew from the beginning who they were who did not believe, and who it was that would betray Him. "Now we know that You know all things, and have no need for anyone to question You; by this we believe that You came from God." "Behold, I send you out as sheep in the midst of wolves; so be shrewd as serpents and innocent as doves. He brought him to Jesus. Jesus looked at him and said, "You are Simon the son of John; you shall be called Cephas" (which is translated Peter). Nathanael said to him, "Can any good thing come out of Nazareth?" Philip said to him, "Come and see."